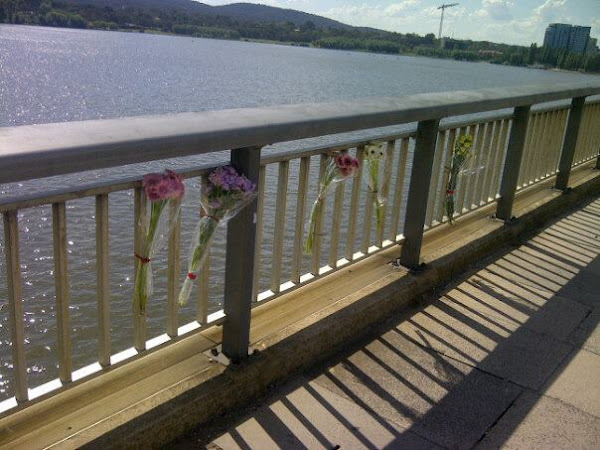 ACT Policing’s Water Operations this morning (Sunday, October 23) recovered the body of a man from Lake Burley Griffin near the Commonwealth Avenue Bridge. A post mortem will be conducted although at this time, there are no suspicious circumstances surrounding the man’s death. A report is being prepared for the Coroner. Our information is the deceased had been drinking heavily at ANU’s Octoberfest before going for an ill advised swim. UPDATE: The Canberra Times are saying it was one William Boyle who appears to have been a very popular guy. A colleague pointed me at an article in the Oct 2011 National Geographic called “The New Science of the Teenage Brain”. I’ve only had the chance to skim it so far, but the essence of the story seems to be that human brains don’t finish maturing until about age 25, and until then, people will behave in ways that are incomprehensible to older people, including engaging in very risky activities that are potentially fatal. While these risky activities occasionally result in harm, up to and including death, they are actually a consequence of positive evolutionary adaptation. In other words, what seems crazy to us old folks is generally beneficial to the human race as a whole. Unfortunately, the positive aspects of the risk taking are occasionally offset by tragedies such as this. If this is correct (and it seems reasonable to me) then all the well meaning attempts to make the world as safe as possible are pointless. Sometimes things will just go sadly awry as they have here. My sincere condolences to the family and friends of this unfortunate young man. It’s widely known and accepted the brain doesn’t finish developing until mid to late teens. The argument though that it’s a positive adaptation though is a croc if one is to try and apply to all circumstances. It simply can’t be. Some risks can pay dividends. Getting piss drunk then going for a swim in a lake offers no possible dividend. I gather it’s mid twenties, not teens. And of course evolution doesn’t apply in specific cases. It’s about the species as a whole (which I gather has just passed the 7 billion mark) not individuals. The idea is that in general, risky behaviour by youngsters results in necessary independence, physical and mental development and lots of other good things. Overall it’s a good thing. However, in specific cases, such as this one, things may not turn out well at all. Just sayin’: when the drunk who kills himself is found to be a middle-class student, the tone appears to change… while earlier instances of working-class drunks killing themselves through various stupidities get mass hilarity often topped off with a Mully nomination. I’d think that would probably be because firstly this guy wasn’t going to hurt anybody else with what he was doing and secondly none of his friends have been committing crimes in his honour cause he was a “fully sick dude n stuff”. It’s widely known and accepted the brain doesn’t finish developing until mid to late twenties. “No suspicious circumstances” again. Someone get the cops a dictionary so they can spell the word suicide properly in their press releases. 2. ‘No suspicious circumstances’ is to infer that ‘foul play’ is not being considered; ie, the death is not a result of a murder, or that it is suicide. Heartfelt condolences to the family and friends of this young man. It has been repeatedly observed that media reports on suicide are linked to a spike in suicides. The police aren’t about to encourage that by putting it in their media releases. Also something can’t be reported as ‘suicide’ unless there is evidence to show that it was actually a suicide…. Perhaps a campaign exposing young men (it seems to be men) to the agony that families and friends go through in these circumstances might be a deterrent. Yeah, I’m sure this would work. The problem is that young males are predisposed to take risks. Presenting them with facts does little solve that problem. I thought Oktoberfest (the big one they have at Epic/Horse Track wherever it is up there) wasn’t until next week? It is, that’s the one with German beer, wine and food with a 50 year heritage. The ANU one is the piss fest where you drink jugs of Tooheys solo, throw up in Sullies then skip classes for the next few days. There are already reports of some UC students going around groping girls after dark following this year’s event and stories from past years of even worse occurring. Wallets, phones and so on lost at the event. Basically an excuse to get off your brain. What’s German about it? I would suggest that if the event were any good, there would be little reason to “skylark.” No doubt it’s a sad case but frankly, you can have fun at any age without being a d-head. The tragedy is that despite these cases happening over and over, people don’t learn. Something positive always emerges out of an avoidable tragedy and this suggestion is one. It would be sensible in anyone’s language for the ANU (and other local tertiary education institutions) to totally ban the annual alcohol fuelled “orientation week” and Oktoberfest and similar drunken festivities. After all, these places are supposed to inspire higher learning; not lower thinking. Why not just ban lakes and rivers instead? Plus anywhere someone might fall and injure themselves. Oh and compulsory stackhats for everyone. I remember hearing about a similar incident years ago about an ANU student. He/she was walking home from the uni bar to their uni residence and drowned in the creek on campus. My daughter lost a close friend a couple of years ago in similar circumstances – ~20 years old, a drunken night out, tried doing something that he probably could have done easily when sober and died as a result. I doubt that there’s an answer to it. My daughter’s friend wasn’t an idiot. Sober, he would have been well aware of the effects of alcohol. Perhaps a campaign exposing young men (it seems to be men) to the agony that families and friends go through in these circumstances might be a deterrent. Yeah, I had a mate who died in similar circumstances when I was 20. Skylarking when drunk is not a good combination. I think young men know the dangers of doing stuff like this but we just think we’re invincible at that age. I think there’s enough knowledge out there, particularly through the road safety campaigns as to what can happen if you’re not careful. But there will always be accidents because this kind of stuff happens to other people right? ^^ This. You can campaign and legislate against stupidity until you’re blue in the face, but people will keep making the choice to binge drink and that’s when they will hurt themselves. Nobody’s fault but their own. The tragic thing is that the ones left behind have to deal with the aftermath.